Consultation will begin this week on short-term and medium-term solutions to the ongoing problem of traffic congestion in the vicinity of Parkmore Business and Technology Park. 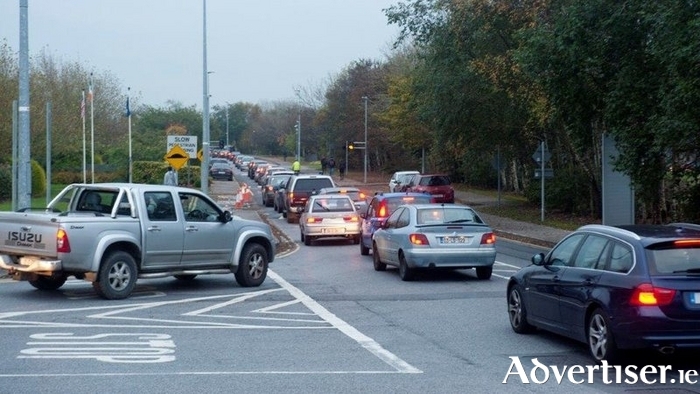 An inter-agency group comprised of Galway City Council, Galway County Council, and the IDA will work with engineering firm, Aecom, with a view to putting in place measures to alleviate congestion. Fine Gael TD for Galway West Hildegarde Naughton, who has secured funding of €100,000 towards road-improvement works in the area, said the initial focus of the consultation should be on immediate measures. “The inadequacy of the road network to cater for the volume of traffic in the Parkmore area is a matter of urgency, which is having an ongoing adverse impact on the quality of lives of thousands of workers in Galway,” she said. Deputy Naughton said that the inter-agency group will first consider improvements to increase road capacity and reduce delays, which will not require planning permissions and can therefore be effected immediately. “These should include new road markings to create additional lanes exiting Parkmore onto the Monivea Road, and onto the Brierhill Junction towards the motorway,” said the Galway West TD. Longer-term measures requiring planning permissions will be examined and progressed simultaneous to the short-term solutions. These may include road widening to accommodate additional lanes. “This is a crucial issue in several respects,” said Deputy Naughton. “Primarily, it is having an impact on the daily lives of thousands of commuters; but it also has the potential to impact on Foreign Direct Investment in Galway. “Prospective investors and multinational companies seeking to locate in Ireland consider the efficacy of the road network, as well as issues that affect the lifestyle of their employees, such as traffic congestion. “Galway could lose out on jobs and investment unless we step up to the mark and address this problem quickly and comprehensively,” she added.